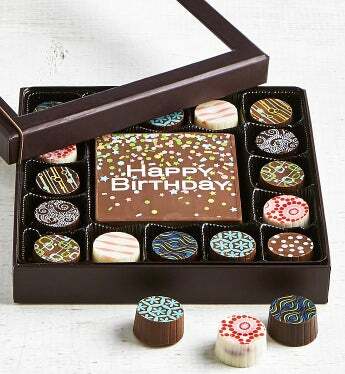 Make it a happy Happy Birthday when you send this beautiful and delicious gift box. A colorful, chocolate card surrounded by 16 Artisan truffles in milk, dark & white Belgian chocolate shells with flavor-infused ganache centers including tiramisu, hazelnut, cupcake, champagne, sea salt caramel, and more. Chocolate adds extra happy to every birthday.